The Uinversity of Rochester Film and Media Studies Program and the Dryden Theatre welcome filmmaker Deborah Stratman to Rochester, April 13-14th. 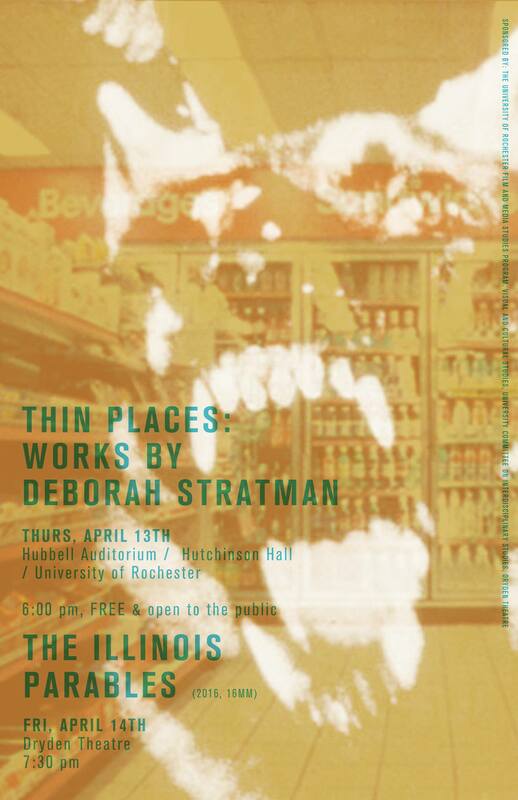 Thin Places includes nine works by Chicago-based filmmaker Deborah Stratman focused on epistemological questions embedded in the relationships between humans and their envirnonments. This screening will be complemented with a second screening of The Illinois Parables (2016, 16mm, 60 minutes) on Friday, April 14th at 7:30 pm at The Dryden Theater, George Eastman Museum at Rochester. More details about this second screening here. These screenings are sponsored by the University of Rohchester Film and Media Studies Program, The Dryden Theatre, The Graduate Program in Visual and Cultural Studies & the University Committee on Interdisciplinary Studies. Poster design by Adam Maida.